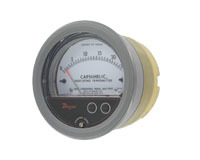 The Dwyer Series 631B Capsuhelic® Differential Pressure Transmitter monitors differential pressure of air and compatible gases and liquids with accuracy. The design employs converting pressure changes into a standard 4-20 mA output signal for two wire circuits. Digital push-button, zero and span adjustments are easily accessed on the front cover. The Series 631 Differential Pressure Transmitter is designed to meet NEMA 4X (IP66) construction. Robust housing offers 500 psi static pressure rating on ranges down to 0.5" w.c.
Service: Compatible gases & liquids. Wetted Materials: Brass, silicone, 300 SS. Accuracy: Transmitter Output: ±2% F.S. (includes linearity, hysteresis and repeatability). Gage: ±3% of full scale at 70°F (21.1°C). Temperature Limits: 20 to 120°F. (-6.67 to 48.9°C). Pressure Limits: -20" Hg to 500 psig (0.677 to 34.4 bar). Thermal Effect: 0.025%/°F (0.045%/°C) includes zero & span. Power Requirements: 10-35 VDC.Output Signal:4 to 20 mA. Loop Resistance: 0-1250 ohms maximum. Electrical Connections: M-12 circular 4 pin connector. Process Connections: 1/4" female NPT high and low pressure taps, duplicated - one pair top for air and gas, and one pair bottom for liquids. Enclosure Rating: Designed to meet NEMA 4X (IP66). Mounting Orientation: Diaphragm in vertical position. Consult factory for other position orientations. Weight: 8 lb 4 oz (3.74 kg). Wet/wet differential pressure transmitter, range 0-0.5" w.c.
Wet/wet differential pressure transmitter, range 0-1" w.c.
Wet/wet differential pressure transmitter, range 0-2" w.c.
Wet/wet differential pressure transmitter, range 0-5" w.c.
Wet/wet differential pressure transmitter, range 0-25" w.c.
16.4' (5 m) cable with M-12 4-pin female connector. Flush mount bracket used with: Photohelic® 3000MR/MRS, Capsuhelic®, 631B Transmitter, EDA. Bracket is then surface mounted. Steel with gray hammertone epoxy finish.